all this happiness: Jackets, Boots, and a Hair-Do. oh i love this outfit! it's so cute! and the hair looks lovely! 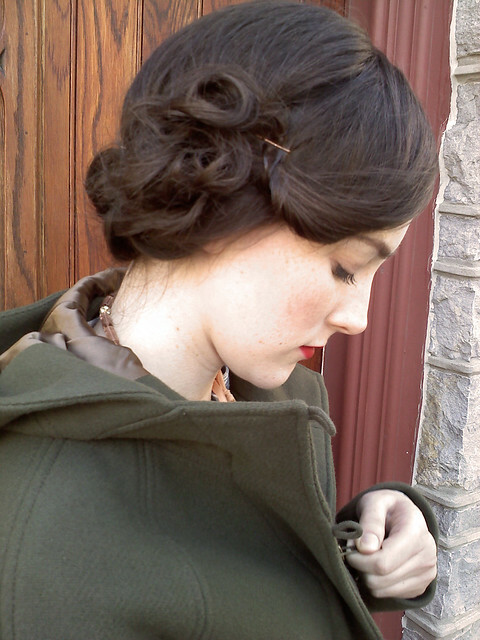 I've tried to do my hair like that time and time again, but never with results so cute and curly! I love how natural and sweet these photos are. Oh, you look just darling! I LOVE the green. Something for me to aspire to. you are just too beautiful, and your hair looks so pretty! 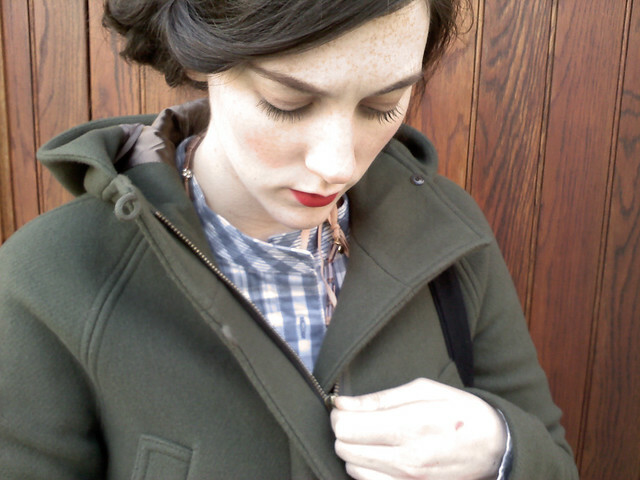 that coat was a worthy impulse buy, it looks warm and classic! You look so nice!! Your hairstyle is so elegant, and I love your coat, the colour really suits you! Kater, you look lovely. The coat is so elegant and unfussy and cozy looking--perfect with almost any outfit. That olive color is fabulous on you too. Where did you find it? I'm having such trouble lately finding simple staples like that coat--who knew locating a well-fitting pair of slim black trousers would be such a struggle. Thanks for the inspiration. I love that jacket! It looks so warm perfect for the upcoming winter months! i love toggle coats! i go through "coat phases" in the winter -- currently i am loving my black peacoat. ooo kater you are so lovely! You have the prettiest profile- kind of a cross between Simonetta Vespucci and Consuelo Vanderbilt. Love the red lipstick... is it Nars? Your coat is fantastic and I absolutely love that lip color on you. Such a sweet look! I don't have any tongs and my hair is probably too long to try that hairstyle! As it gets darker in the evenings here it does get harder to remain cheerful but you've got the right attitude. thats to funny! I tried to do that same tutorial this morning! didnt work out though, my hairs just too long! You are gorgeous! I love your coat! Impulse buy or not, it was certainly a great one and you've made a good point; it is important to have a versatile winter coat in ones wardrobe, wish I had thought of this earlier but better to read this now than never, oh well, next winter! You look so nice with the red lips! That outfit is adorable!! 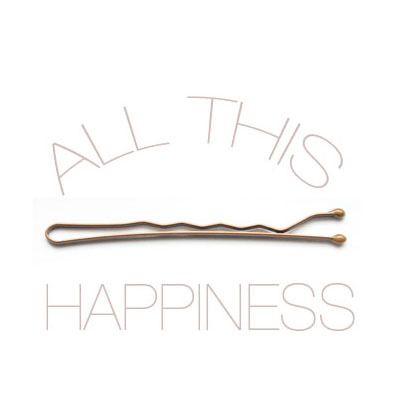 And you pulled off the side chignon beautifully! I've practiced it a couple times but am not quite happy with it yet, the practice continues. Your skin and hair is gorgeous! oh my goodness, SO gorgeous!!!! you look beautiful. i'm so impressed!!! this makes me want long hair again. You did a fantastic job with the hair. Brings your whole outfit together. The hair and lipstick are the perfect combo. I love it! Where is that dress from? So pretty! I just bought that coat in the same color and I love it too! It's a great neutral color, but not basic! You did a great job on the hair too! Your hair looks so pretty like that! I'll definitely give that tutorial a try tomorrow! I'm terrible at hair-styling, but this doesn't look too difficult. So lovely! You are gorgeous and that hairdo is fantastic! Hm, yeah, I'll give that a try! Thanks a lot! You look great! I hope I can get my hair to this before I get bored of it and chop it again! And Hunters are the best - I can't live without mine. I have been looking for exactly this coat this year! Any chance you'd share where you found it..? I would love to see a tutorial on this hair-do! Hello! I've just discovered your blog and it is adorable! I love how you wear the scarf in your hair as a bow headband, I've been trying to do that for months, but it never comes out quite right. Can I ask where this coat is from? I have been looking for something warm and hooded! Thanks for the inspiration! Your hair really does look lovely. I'll have to check out the tutorial! lust lust lusting this jacket.. I love this color on you! Great blog- will def be back! We are running a non-profit site; only for the sake of information sharing. Well! We visit your web site egularly. Since our site is based on fashion news, current updates on fashion, we believe it would surely help us to be more effective if we get your site’s link. We have already placed your site’s link in our site: Prominent Fashions prominent-fashions.blogspot.com. You can visit the site t-shirtandtails.blogspot.com for our site's link reference. I wish you could place my blog in your site with a title “Fashion World”. Hoping for a positive return. loving the jacket and boots! you're so lovele! gorgeous last picture! i just found your blog and it is so, so lovely! this is random, but i especially love your eyeliner. it always looks fabulous! it takes me so long to get that perfect, slightly winged look, but yours is flawless:) looking forward to more posts! I love this, your hair is gorgeous! If they appeal to you, drop me an email at annahlegg@gmail.com, I'd be happy to send you one at less-than-full-price! red lipstick always makes me feel classy! I love your entire outfit and blog dear. I never got into Mad Men, but I always heard good things about it! if feel the same way about eyeliner as you do about lipstick - I feel weird without it now! DO you mind me asking where you got the coat?? pretty lips and i love your coat! OMG i love your style!! Your hair style here is great! Lovely!